The name of this beer commemorates the fact that this is being written on the 60th anniversary of D-Day. What is this thing that Dogfish Head Brewing has unleashed? 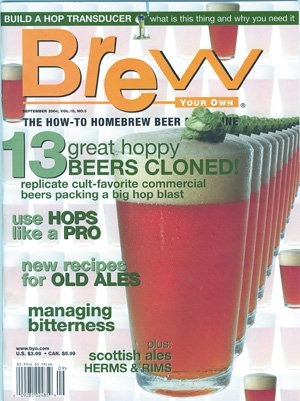 Here’s how to build the ultimate serving gadget for hopheads! Two "ordinary" brewers discuss the best in their bitters. How can one little cone bring so much happiness? Professional brewers give their thoughts on hops and hoppy beers in our brewers’ roundtable. Pull up a seat and join the discussion. Your brewing calculator says your beer will be 45.27 IBUs….but will it? How will you know? What you need to know to make sense of bitterness calculations and hit your target bitterness consistently.